CAMBODGE – Angkor Wat - Scientists have long known that the sandstone blocks used to build the famous Angkor Wat temple and other monuments in the ancient Cambodian city of Angkor came from quarries at the foot of a sacred mountain nearby. But how did the 5 million to 10 million blocks, some weighing more than 1500 kilograms, reach Angkor? Researchers report in a paper in press at the Journal of Archaeological Science that when they examined Google Earth maps of the area, they saw lines that looked like a transportation network. Field surveys revealed that the lines are a series of canals, connected by short stretches of road and river, that lead from the quarries straight to Angkor. The roads and canals—some of which still hold water—would've carried blocks from the 9th century to the 13th century on a total journey of 37 kilometers or so. The researchers don't know whether the blocks would've floated down the canals on rafts or via some other method. Scholars had previously assumed that the blocks were floated down a canal to the Tonle Sap Lake and then upstream on the Siem Reap River, a route of 90 kilometers. The newly reported canal network would've taken many months and thousands of laborers to construct, but it would have been all in a day's work for Khmer engineers, whose elaborate reservoirs and other hydraulic works at Angkor still inspire awe. 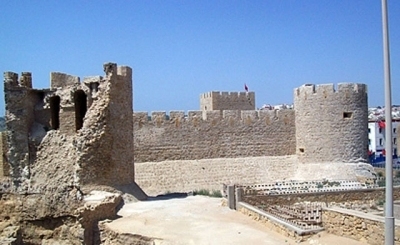 MAROC - “Château de la Mer”- One of Morocco’s most important archeological sites, the “Château de Mer” or Palace of the Sea, is threatened with collapse owing to a combination of natural and man-made conditions. The Palace of the Sea, also called in Arabic Qasr al-Bahr, is a fort on the Atlantic built in 1508 by the Portuguese in the city of Safi in Western Morocco. In 1924, the fort was the classified by the French occupation as Morocco’s first archeological site owing to its historic importance. For five centuries, the castle has been exposed to ocean waves that kept eroding the stone cliff on which it was built. Now Qasr al-Bahr is in danger of collapse. According to Abul Qassem al-Shibri, head of the Moroccan Portuguese Studies Center, erosion has surpassed the site in which the fort is located and extended to the main street and part of the old city. USA - McGrath - The human skull appeared, still partially buried, toward the end of the day as workers in McGrath finished scraping away a swath of dirt for a spot to store gravel. And the ancestral remains they uncovered weren't alone: The skeleton was huddled with the bones of two other people, where they'd been hidden for at least a hundred years. An archaeologist who looked at the bones found earlier this month says they might turn out to be much older than that. It's possible that the three people -- believed to be ancestors of the Athabascan Natives in the area -- died as far back as a thousand years ago, covered by layers of river silt before the invention of the printing press or magnetic compass. For now, a more precise date on the remains is a mystery. The three skeletons Dale and LeBlanc uncovered were those of a child, probably between the ages of 2 and 5, a male in his late teens or early 20s, and an older man, Dale said. "They weren't laid out nice and flat. They were deposited in a compressed manner," Dale said. "This was not a grave. These guys were deposited there." The position of individual bones -- appearing to have been pushed close together -- indicated some kind of water flow. As for how they died, Dale can only guess. A discovery of preserved ancestral human remains in Interior Alaska is rare, Dale said. For one thing, it had been common practice for Athabascans to cremate the dead, she said. And the soil in the area is so acidic, bones are generally broken down over great lengths of time. Dale said she doesn't know exactly why the skeletons were preserved so well. But she found also evidence of fire pits in the dirt above them and suspects animal bones were burned and left in the soil, making it less acidic. USA – New York - The Metropolitan Museum of Art today launched MetPublications, a major online resource that offers unparalleled in-depth access to the Museum’s renowned print and online publications, covering art, art history, archaeology, conservation, and collecting. Beginning with nearly 650 titles published from 1964 to the present, this new addition to the Met's website, will continue to expand and could eventually offer access to nearly all books, Bulletins, and Journals published by the Metropolitan Museum since its founding in 1870, as well as online publications. FRANCE - Sallèles-d'Aude - Au détour du dossier consacré aux nouvelles perspectives pour le musée Amphoralis, Jacques Bascou annonce une nouvelle stupéfiante : des amphores gallo-romaines originaires du village de potiers de Sallèles-d'Aude ont été mises au jour en Inde ! Une telle découverte confirme l'ampleur des exportations réalisées alors depuis la Gaule… mais certains spécialistes restent encore prudents. C'est le cas de Michel Perron d'Arc, ancien directeur du musée sallélois. "Le type d'amphores retrouvé correspond bien à celui qui se fabriquait jadis à Sallèles, mais on a recensé au moins neuf autres sites où de tels objets étaient produits. Or, à l'oeil nu, impossible d'établir la provenance exacte". Seules des analyses de pâte permettront d'identifier si ces vestiges sont effectivement sallélois.